Floating architecture and urban agriculture are two things we hold near and dear to our hearts, so you can imagine our delight when we heard that a new buoyant food production ecosystem could be headed to town. Conceptualized by New York-based artist Mary Mattingly, Swale is a self-sustaining food forest that could grace the waters of the Hudson some time next summer. If the project comes to fruition, the free-floating urban farm would dock at different piers around the city for months at a time. Swale would be composed of a 50-foot diameter floating platform with a gangway entrance and walkways that would allow the public to harvest food grown inside the garden. Mattingly is working with a number collaborators to get the project up and running for next summer. Students from Stuyvesant High School, Dwight-Englewood, and Fairfield University are working with local gardeners to develop a self-sustaining planting scheme for Swale. The initial plan for the lush garden is to find a way to use wetland plants to wick and filter water from the river, which will be used to feed the edible perennial plant system. As for the structure itself, members of the U.S. Coast Guard are working with a nautical engineer and landscape architects to design the superstructure, perhaps using shipping containers and I-beams for the main building components. Along with floating the message of food accessibility to New Yorkers, the sustainable installation will also take aim at the impact of large-scale supply food chains as well as excessive food waste practices. The Swale project is being financed in part by A Blade of Grass, which provides artists with resources in order to create artwork that promotes social change. If the project comes to fruition, the free floating edible food-producing ecosystem would dock at different piers around the city for months at a time. 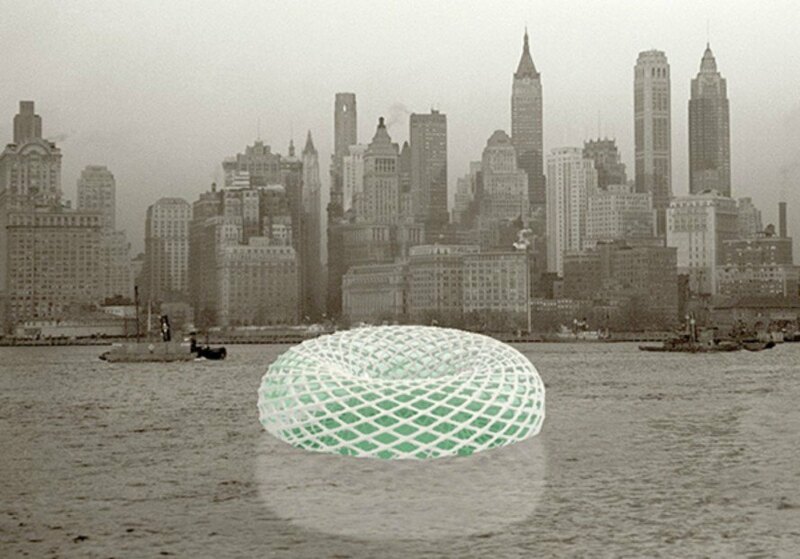 The 50-foot diameter floating platform would be built with a gangway entrance and walkways that would allow the public to harvest food grown inside the garden. The initial plan for the lush garden is to find a way to use wetland plants to wick and filter water from the river, which will be used to feed the edible perennial plant system. Mary Mattingly worked with thirthy Dwight-Englewood students in order to build modular planter beds for Swale. One rendering shows the potential of building Swale with 20' shipping containers and I-beams. Students from Stuyvesant High School, Dwight-Englewood, and Fairfield University are working with local gardeners to develop a self-sustaining planting scheme for Swale. The renderings for Swale are still being considered, but most of the designs will utilize shipping containers.